A quick check of “The Oxford Companion to Food” by Alan Davidson (Oxford University Press, 1999) was all it took to set us straight. It turns out that muffins, from French moufflet or “soft bread,” originally referred to English muffins, which were leavened with yeast, shaped into rounds and cooked on griddles. “The inside should be like honeycomb,” said Hannah Glasse, the famous 18th-century British cookbook writer. The transformation to what Davidson calls, “American muffins” came when bakers began making small, round cakes, usually with baking powder, a small amount of sugar and fruits, nuts or savory ingredients. Cupcakes, however, are downsized sweet dessert cakes, usually frosted and decorated. And while some — like the perennial favorite blueberry muffin — might be mistaken for cupcakes, our pumpkin cheddar muffins have no identity crisis. With cornmeal, poblano peppers and sharp Cheddar cheese, and sporting a savory streusel topping, they’re perfect paired with a hearty vegetable soup or chili for fall. I have been so enjoying this blog. 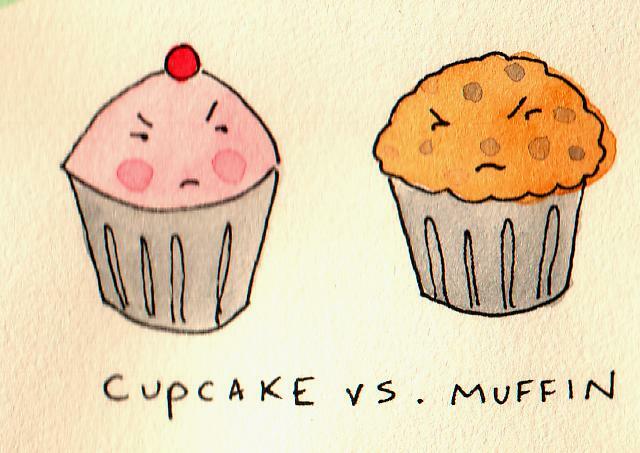 The pictures always make me want to find a cupcake NOW! And while cupcakes are fabulous, I have to say that muffins also make me happy--especially those found in the book I co-wrote called, "Stud Muffins: Luscious, Delectable, Yummy (and Good Muffin Recipes, too!" (Yes, a shameless plug!) The pictures in our book share focus with the tasty muffin and some equally scrumptious male models holding the muffin. As we like to say, this is definitely not your grandmother's cookbook. Check us out at www.uponastarproductions.com!